Click the button above and PricePlow will email you with updates from Inspired Nutraceuticals. Aug 16, 2016 DVST8 White Cut: You Ready for Pre Workout DEVASTATION? The quote above says it all: DVST8 is that good. Read more at our DVST8 blog post, but long story short, this is a can't miss pre-workout supplement! 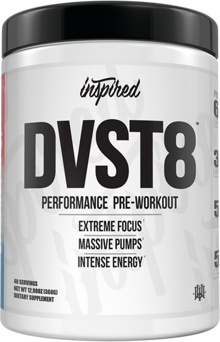 DVST8 White Cut is NOT your average pre-workout. In a world full of cookie cutter caffeine and pixy dust blends, DVST8 White Cut raises the bar to a whole 'nother level. No other pre-workout on the market contains the combination of energy, focus, pump, and endurance that Inspired Nutraceuticals has created. Not even Pre Jym, a product whose efficacious dosing and performance are often touted as "industry best" can touch DVST8 when it comes to energy and performance. 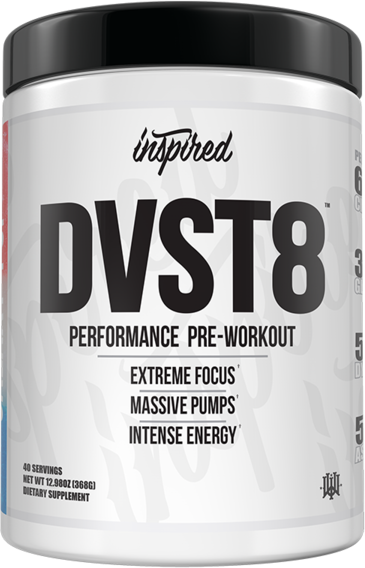 But we're not the only ones who are excited about DVST8, Stack3d has already deemed it a top 10 pre-workout and has offered the quote of "Best pre-workout in America." DVST8 uses both innovative and proven ingredients in a blend that is among industry best and will be tough, if not impossible, to top. Pre Jym has held the top spot in the high dosed pre-workout category for a long time. It's high dosed blend is loved by many and is often referred to as one of the best pre-workouts available. However, Pre Jym has officially been overtaken by the new kid on the block. DVST8 White cut beats Pre Jym on dosing in several different areas, and outclasses it in a big way by including 2-Aminoisoheptane, the next gen stim that has been touted as the "New DMAA." The most recent successor to DMAA, 2-Aminoisoheptane (DMHA) is a potent stimulant that provides long lasting energy and focus. Unlike caffeine, 2-Aminoisoheptane users report long lasting, clean energy and focus that is second to none with almost no crash! This ingredient is among the newest and hottest on the market right now, and is definitely worth a try if you have not had it. Beta Alanine - Boosts strength and endurance in the gym and gives users beta tingles. One of the most effective supplement ingredients on the market. DVST8 white cut contains a full 3.2g dose with 2 scoops. Citrulline - A great nitric oxide booster, Citrulline is extremely effective in high doses. DVST8 White cut goes the extra mile by dosing this at 8g per 2 scoops which is 2 more grams than what Pre Jym contains. Betaine - A nitrate that has been shown to both boost nitric oxide and improve strength and athletic performance (similar to creatine), Betaine is dosed at a whopping 4g in DVST8 White Cut, which is more than what is contained in almost any pre-workout on the market. Flavor - With DVST8's new flavor system, taking this pre-workout is a treat. Innovative flavors such as Galaxy Pop, Pacific Crush, and California Gold make it enjoyable to drink before working out.